Unlike most people, I actually look forward to receiving my utility bills each month. Hard to believe? Let me explain. I view each month’s bill – whether it be from the water company, the electric utility, or the natural gas provider – as a way to gauge how well I am doing in my efforts to both conserve energy and save money. Did I use less power than last month? Were my showers shorter? How much money do I get to keep in my bank account this month? Because I have the memory of a goldfish and not that of an elephant, for each utility I have a spreadsheet in Google Docs where I track each month’s usage and cost. For electricity, I note how many kilowatt hours kWh) I use. For natural gas, I track how many cubic feet I burned (it is billed in units of 100 cubic feet at a time). And for water, I watch how many gallons of fresh water I used. I note the date of each bill along with the total (before taxes) for each month. With just a quick glance, I can see how well I did versus the previous month and have a figure to shoot to beat during the current one. It’s quite a fun game as well as a “feel good” one as I know if I beat last month I did my part to burn less fossil fuels – and that’s something we all need to strive for. – Depending on where you live, you may see rather large swings in energy use throughout the different seasons. 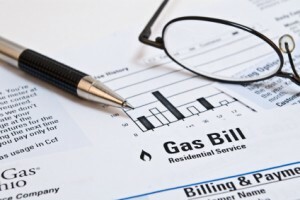 Summer may have a much higher electric bill than winter, but winter may see an uptick in the natural gas bill. Where I live the temperature stays kind of the same on average throughout the year, so my bills don’t fluctuate too much. – Reward yourself for a job well done. Whether you put the savings in a savings account, splurge for an extra drink next time you are at a restaurant, or buy a bigger box of popcorn at the theatre, it’s important to give yourself a little bonus when you succeed at your goals. It gives you that much more incentive to do even better next month! – Make sure you keep your appliances clean and free of dust and crud. Nothing will sap your energy efficiency faster than a dryer vent that has never been cleaned or refrigerator coils with baked on grease and cat hair. – Use power strips wherever – and whenever – possible. Nearly anything that can be unplugged when not in use is on power strips in my house. TVs, DVD players, radios, toaster ovens, wifi extenders, and computer equipment get switched off every night before bed and don’t get turned on again until they are needed. Most all electronics sit idle in “stand-by mode” most of the time, sipping up that juice from the electric grid. – If you have ceiling fans, use them. They can help cool down or heat up spaces, depending on how they are used and which direction they are spinning. If you don’t know which direction does which job, this link should help you find the best setting for your home. As an aside to discussing utility bills, I also play the same game with my weekly trash pickup. While I don’t measure recyclables, I do keep track of how much trash I dispose of each week. For the two of us, I have managed to have gotten our trash disposal down to about 3/4 of a 13 gallon trash bag each Wednesday. I would still like to see that be even less, but for now I am happy. This summer, start a new tradition in your house and try to compete to lower your utility bills. Your wallet and the environment will thank you, and if you succeed you may even get a nice bonus out of it. Good luck! This is a nice idea, but I live with 2 other people so it is hard to know what part of the bill was my usage and what was theirs. Any suggestions? How can I suggest to them that we need to lower our usage in a nice way? I pay a fixed rate for utilities, and once every 6 months the company does a meter reading to adjust a credit note or ask for more money monthly. It helps with the budget but unless you track carefully your meter and write down consumption you can’t really know how much energy you use. That’s exactly why I have a spreadsheet to keep track of consumption, otherwise I wouldn’t be able to either! This is our first month really watching our utility bills. I have unplugged a lot of things and am making conscious moves to use less energy. We’ll see if our bill is affected at all! We have an energy monitor which we plug into our appliances to test. It works really well and lets you see if you can make any changes. Power strips should also be turned off when not in use – even the tiny indicator lights add up. Agreed. We have lots of power strips so the cost would really add up. Sounds fun! Our utility has recently installed smart meters in our area. Now I can go online and see our electricity usage by the hour for each day. You can really get a feel for which appliances are the energy hogs! Very cool. Our company hasn’t done that but we have a home monitor we use which works well. It is very informative. That’s actually a good idea. You need to monitor it to know if you really are improving. Okay, we won’t throw away our bills the next time. If you don’t want the clutter try scanning them so you can reference them. We find this works well. I’m a big fan of ceiling fans – we open the windows and turn ours on and it really cools the place down! We try to create a cross breeze with the windows on each end of the house and it seems to work quite well. $70 is a lot of money. Talk about a good investment when you made that change. We also have budget billing like yourself. We quite like it . We still use it to evaluate where we are at though and if we can cut back anywhere. I pay close attention to our electric bill because we don’t have gas. I always try to beat the previous year to see what I can do. Great. Little contests like that keep us motivated. We try to improve each year too. I can see that being a fun game! It’s sort of like the tracking I do in my running app. 🙂 My utilities are pretty low as I only pay for electric, but I’ve learned a few good tips from people like making sure your freezer is full because I guess your fridge works harder if it’s empty? And getting better about unplugging my computer each night. Every little bit counts! Absolutely. Every little change really does add up. I am trying to better and turning off lights when not in the room. I grew up with this habit of leaving lights on to see what you were doing or too ward of criminals but it really isn’t necessary. I can just turn them on when I need the room. I can check all the usuage when I log into my account for hydro and water. I can compare last year and this year so that’s what I do. I do one thing that you mention that many people don’t and that is pull out the appliances. I do that every couple of months, clean up and put it all back. It makes a big difference and we’re always aiming to keep it lower or as low as we can to a reasonable extent as long as we are comfortable. Good stuff. We also have the option of reviewing things online. It is so handy to be able to compare and then make changes. I just moved into a smaller home and love the smaller utility bills. Once I am in the home for 12 months and establish a baseline for electricity usage I am going to look at installing solar panels. I also want to look at geothermal but don’t expect it to be as affordable upfront as solar. It depends where you live but where I am geothermal is more affordable than solar. You should price it out and see. Great ideas here! My electric company has a website where you can monitor your account. I go on each month when I pay the bill to compare that month to previous months and to the previous year. We also use power strips a lot around here and when its not being used we turn off the strip. One thing I can recommend (because we have an HVAC company) is to have your heating and cooling units serviced twice a year and keep your filters clean. Many people don’t realize this but it can make a difference in your usage as well as the life of your system. Great reminder about getting things serviced. Just because they are still working doesn’t mean they are working very efficiently. I should get our looked at.